Friday The 13th Part 2 is one of the most beloved films in the franchise and continues to be a majority fan favorite. Although the film suffered major cuts at the hands of the MPAA to secure an R rating, many view the first sequel of the franchise to be the definitive tale of Crystal Lake, Mrs. Voorhees, and her son Jason. This idea is probably helped by a number of scenes that even today may be found to be quite shocking. So, we thought it would be fun then to list the Top 5 Shocking Scenes in Friday The 13th Part 2! There were two characters that returned from the original film in the franchise for the sequel, one being Alice Hardy and the other Crazy Ralph. After the first character had already been surprisingly dispatched earlier in Part 2, there was no way ol' Ralph would be killed off too, so we all thought. Well, there were many conventions that were thrown out the window in this film and keeping continuing characters in the story alive was not one them. Ralph's demise may not have been the most graphic or jump inducing, but it was shocking nonetheless as no one expected the Prophet Of Doom to die at camp by not heeding his own words of doom. There is sure to be some debate over the number four choice on this list, but lets look at the events of the film. Terri's dog Muffin wonders off into the woods of Crystal Lake and happens upon Jason Voorhees. Muffin stares up at Jason and the scene cuts to an image of hot dogs being grilled over an open fire. The scene is humorous, but did fans really think that Jason would kill the dog? Just a short time later in the film, Jeff and Sandra go trespassing at Camp Crystal Lake and find a mangled dog that looks just like Muffin. This disturbing moment shows that the film is not only willing to kill off their two returning characters, but animals are not off limits either. It's a shocking scene that is momentarily reprieved by a confusing ending to the film that shows Muffin return in a dream sequence. When word of a sequel to the highly successful Friday The 13th 1980 was announced, fans were happy to find out that Adrienne King would be returning to reprise her role as Alice Hardy. The uncertainty surrounding who the killer would be and how the filmmakers could pull off a new menacing presence seemed to cloud the writings in Fangoria magazine that Alice may die in the film. Since there was no Internet rumors flying about back then about the behind the scenes happenings of movies, Alice's death was quite unknown and shocking until viewing Part 2. Her death set the tone for the anything goes mentality of the movie which we have already highlighted in our number four and five spots on this list. 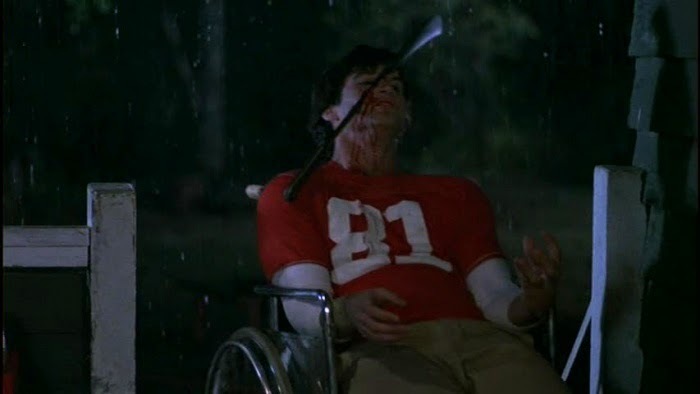 It's one thing to kill off returning characters in surprising fashion, and even another to have Jason kill a dog, but would the producers, writers and director dare go another step further and kill a handicap person bound to a wheelchair? We all know the answer and if there is one scene in Part 2 that makes fans cringe with anticipation, but at the same time feel complete sympathy and disdain, it is Mark's death. The fact that Jason sneaks up behind Mark without even the dignity of taking him head-on is really quite shocking. 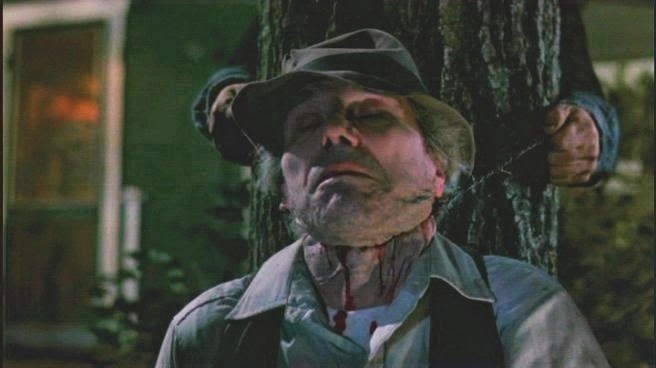 Perhaps Jason killing Mark from behind could be viewed as a mercy killing without struggle, but this scene ranks up there in the all time shocking moments in Horror film deaths. Lets face it, Part 2 is a great big cookie cutter copy of Friday The 13th 1980. Characters, circumstances and setting are all successfully lifted from the sequel's predecessor, however, the climactic ending where Ginny discovers Jason's shrine to his dead mother's head is the most shocking moment of the film. The revelation that Jason has kept his mother's rotting head and clothing is both disturbing and tragic. Ginny's ability to process everything she is witnessing in mere seconds and turn it into her advantage against Jason is truly what makes Part 2 such a success with the fans. The shrine scene gave Jason a personality and summarized the dread felt by not only the victims of the first two films, but that of Mrs. Voorhees and her son Jason up to that point. Let us know what you think of our latest Ranking in the comments below. Would you rank these scenes the same? What scene would you add or remove for your most shocking scenes of Friday The 13th Part 2?